This week I started the Distribution courses in Acumatica University and I’m having a great time! It’s nice to be out of the technical courses and back into learning more about the application functionality. The first course up in Distribution is called D100 Inventory Management: Basic and it walks you through the Inventory module. I’m still making my way through, but I couldn’t help notice that the LIFO inventory valuation method seems to be missing in the Stock Items (IN202500) screen. What’s going on? Then I thought about it a little more and wondered, “does anyone actually use LIFO anymore?” After some quick Googling, it seems that they do, but it has become a contentious issue. LIFO stands for Last In First Out. For example, if a grocery store sells water, they buy it wholesale from a distributor at a bulk discount. Then they sell it to you the consumer. If they bought 1,000 bottles for $.75 per bottle, then their inventory shows $750. Maybe water isn’t selling at all for some reason, but six months later the grocery store still buys 1,000 bottles more from their distributor due to some contractual obligation. However, this time for $1 per bottle since prices have gone up. Now their inventory has layers in it. They have 1,000 bottles at $.75 per bottle for $750 and 1,000 more bottles at $1 per bottle for $1,000. $750 plus $1,000 equals a total inventory of $1,750. Now, let’s say that someone finally walks into the store and buys some water. Actually, a bunch of people buy water, 1,000 bottles to be exact. If a company is using LIFO, then the most recent 1,000 bottles of water are taken out of inventory for accounting purposes and you are left with the original 1,000 bottles at $.75 per bottle for a total inventory value now of $750. The only times I have come across LIFO was back in college, then again when studying for the CPA exam. I remember thinking that it didn’t make any sense to me. Looking at the grocery store example above, does it really make sense to sell the new bottles of water first? Wouldn’t you sell your old water bottles first to get rid of your old inventory? Most likely, the physical water bottles that were sold were the old water bottles. But LIFO still allows you to value your inventory using the old costs. It doesn’t make sense! LIFO is like stack parking. When I lived in Los Angeles, it was a widely known fact that you try to avoid stack parking as much as possible. 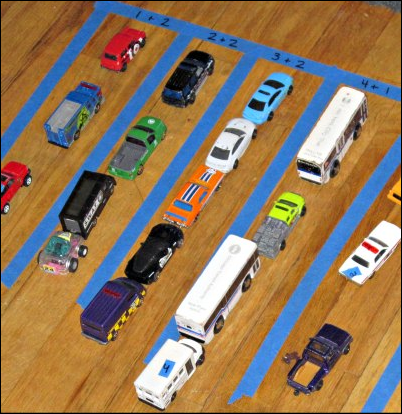 Many parking garages have long parking spots that fit more than one car. If you are behind the first car, then you have to give your keys to the parking attendant which many people aren’t comfortable doing. With stack parking, the last car in must be the first car out. LIFO is a great way to explain stack parking, but not inventory movement/costing. First, I found a 2009 article from the accounting authority publication of Journal of Accountancy called The Death of LIFO? (click here). It claims that LIFO is not widely used, except in the United States. However, even the accounting rules in the United States are now heavily influenced by the fairly recent IFRS (International Financial Reporting Standards) rules. And LIFO is not accepted under IFRS. Then there is an IRS (Internal Revenue Service) LIFO conformity rule (IRC § 472(c)) which requires that a company using LIFO for tax purposes also use LIFO for book purposes. But, if LIFO eventually becomes outlawed for book purposes because of IFRS influence on US GAAP, then it wouldn’t be allowed for tax purposes because of the IRS conformity rule. Bottom line, are we looking at the death of LIFO? Next, I found a 2013 article from The Journal Gazette in Fort Wayne, Indiana entitled, Is LIFO as we know over? (click here). It talks about a provision in President Barack Obama’s 2014 budget proposal that calls for the end of LIFO. Then it goes on to lament the impact that it would have on local businesses. Finally, it concludes that many companies are resigned to the fact that we’re almost at the end of LIFO. Here is a more official link on the US Treasury website describing the 2014 fiscal year proposal to repeal LIFO in the United States (click here). Take a look at page 88. Apparently this has become a hotly debated topic. There is even a website devoted to saving LIFO (click here). I couldn’t find any articles talking about whether or not the 2014 budget provision passed in Congress last year, but I assume it didn’t because the 2015 budget contains the same proposal, now on page 93 instead of page 88 (click here). So, it appears that the issue is not yet settled. However, with IFRS, the Obama administration, and the SEC all joining in the hunt to eliminate LIFO, it appears that LIFO won’t be around for much longer. 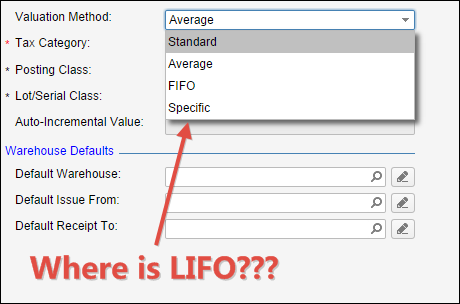 Why Doesn’t Acumatica Support LIFO? Maybe the developers of Acumatica have seen the writing on the wall regarding LIFO so they don’t see a need to support it. Maybe companies that implement Acumatica are forward-looking companies who realize that LIFO is basically dead so none of them require it. Maybe Barack Obama is secretly an investor in Acumatica and he has lobbied hard to keep LIFO out of the product. So What’s The Big Deal About LIFO? Personally, I don’t really think it matters that Acumatica doesn’t include LIFO. If they ever pick up a customer that requires it, I’m sure they’ll add it. In the meantime, it doesn’t appear that Acumatica supports LIFO. And if things keep going the way they’re going here in the United States, maybe they’ll never need to.